...and now it will be even more fun! According to mmo-champion, they are going to double the honour gaind from killing people. That, and implement a random battleground system. If it's going to be as addictive as the random dungeon system, then beware horde, because here I come! I always loved long alterac valley fights. No importance to the bunkers or towers, just mindless fighting be it near the bridge to the alliance base or the valley just before the horde base. It moves slowly, the enemy starts to get a lead but then it is quickly driven away. You get the bonuses from the commanders, which make these fights long and enjoyable. However AV can be boring, if people choose to rush for the towers and just nuke the enemy leader. Favourite BG huh? Well i can tell one thing with absolute certainty. Strand is by far the worst BG ever for me, it's my least favourite for plenty of reasons. As for the favourite ones...Warsong and Alterac Valley with premades get the 1st place for me. Non-premade i'd say...Isle of Conquest since you can use plenty of stuff, AB for MCing people off the cliff in Lumber Mill, EotS when your random team has great teamwork and i love using my rocket boots + Levitate to get the flag first. Alterac Valley can also be fun most of the time, at least compared to the other bg's. Not counting Wintergrasp in because of the tenacity, and because this is a "favourite BG" thread. I don't see Wintergrasp as a BG anyway. My favourite BG? Alterac Valley. This! Oh please let's AV together! You know those old Alteric Valleys that could last for weeks. Oh, how I loved those. Sure, it was impossible to gain any badges at all, but at least it really felt like you were fighting a true war. I even once had that I logged in before school, play half an hour of AV, then log off and spend five hours on school, only to come back, join again and find out half of the people were still playing and basically nothing had changed. Also, those were the times where people did something with those recourses. I haven't seen Lokholar the Icelord in years and I bet you that if you ask a random person who he is, half of the people won't know who you're talking about. Pah, I can't be bothered to go trough all the starting stuff for the twentieth time. I'll just wait and level a goblin up in the new world or somethin'. 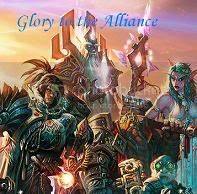 Maybe even an alliance, would make a nice change. OH NOES, NIRASH! WE'RE LOSING YOU!, YOU'RE SLIPPING AWAAY! NOOOOOOOOOOOOOOOOoooooooooooooooooooooooooooooooooooooooooo!